For many people yard work is a form of fun and enjoyment. Sadly, it is also a time of aches, pains and injuries. Know how to keep yourself safe while you are working outside by taking safety precautions and being aware of safety tips for working in the yard. The following safety precautions and tips will help keep you safe and injury free while you are working in your yard. Take 5 to 10 minutes to warm up your muscles by doing light exercises or stretching before starting your yard work. Dress properly for working outside in the yard by wearing long pants, a long sleeved shirt and sturdy comfortable shoes. Keep children and pets away from the area when you are doing yard work. Have the right tools for the job you are doing. Rakes should be comfortable and the right size for your height and strength. Wear gloves while you are doing any type of yard work to help prevent your hands from blistering. 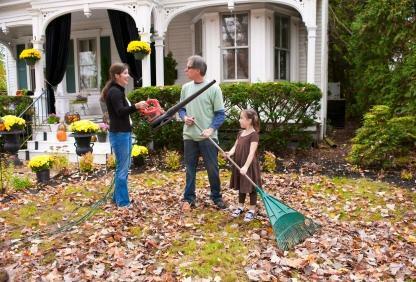 Yard work such as raking involves repetitive motions. Changing your position often helps to prevent muscle pains and cramps from occurring. Always watch for low branches, large rocks and tree stumps. Be aware of uneven ground surfaces and slopes. When you pick up leaves, do not bend over from the waist. Bend from the knees. Do not overfill leaf bags. Do not carry full bags of leaves over your shoulder. When you are weeding, a half kneeling position is safer than bending forward. When you are using a ladder make certain it is firmly on the ground. Never climb to the top of a ladder. When you are pruning hedges, hold the pruning shears close to your body. Be careful when pouring the gas into the lawn mower and power equipment. Always make sure all of your power yard work equipment such as lawn mowers, edgers and trimmers are in good working order. Make sure to review and follow the recommended instructions for lawn mowers and power lawn and garden equipment. Wear protective goggles when you are mowing the lawn or working with other power outdoor equipment. Wear hearing protection when operating loud equipment. Never use your feet or hands to clear anything from underneath a lawnmower. If you must leave the lawn mower for any reason, turn it off. Never leave a lawn mower running unattended. Do not mow the lawn in sandals or with bare feet. Never drink any alcoholic beverages when you are mowing the lawn or working with any other power yard equipment. Never run a lawn mower or gas powered lawn or garden equipment indoors. It's important to educate yourself about yard work safety, or a day working outside could result in sore aching muscles or a trip to the hospital emergency room. Perhaps the most important tip is don't try to do everything in one day. Take breaks when you need them, and don't overexert yourself. It's alright to leave some of the work for another day.